Ahi Kā is a festival of fire and light, celebrating renewal and belonging this Matariki (Māori New Year).Bring the whole whanau down to Whairepo Lagoon on Wellington's waterfront for the opening procession Nga Wai Piāta (Streams of Light) from 6-6.20pm featuring children from seven regional schools. This procession will light the fire on the water and will be burning until the end of the event at 10pm. Activities and food trucks can be found along the Waterfront after the opening ceremony. Māori performers and storytellers can be found on stages around Whairepo Lagoon and Odlins Plaza. Remember to bring extra layers as the weather will get colder as the night goes on. Mai FM 100.5 will also broadcast the event live onsite. Due to the popularity of this event, we recommend taking public transport. Metlink are providing additional services on Kapiti, Hutt Valley and Johnsonville lines after 9.30pm for your convenience. 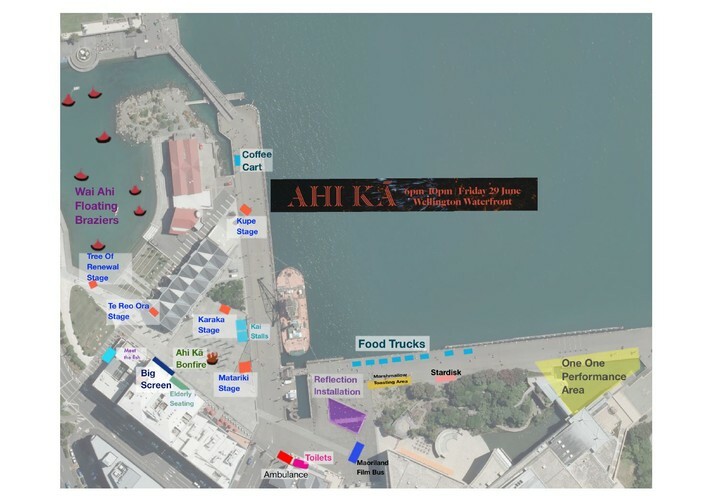 Visit their website for more info - https://www.metlink.org.nz/service-updates/celebrating-matariki-on-the-waterfront-weve-got-services-to-get-you-home-friday-29-june/. If you wish to drive please note, parking fees and the 2 hour parking limit apply til 8pm for street parking so you may prefer to use a parking building. You can visit our website for more information on car park buildings in the city - https://wellington.govt.nz/services/parking-and-roads/parking/where-you-can-park/car-park-buildings. Postponement date: Saturday 30th June, 6PM–10PM. If this event is postponed, the announcement will be made around 12 noon Thursday 28th June. You can find these updates through our Facebook page and contact centre. Please note that the Waterfront is a liquor ban area.